I was looking for a big mug to pour a long night in and reached far back into the cupboard. Debussy’s Clair De Lune tinkled when I lifted one. 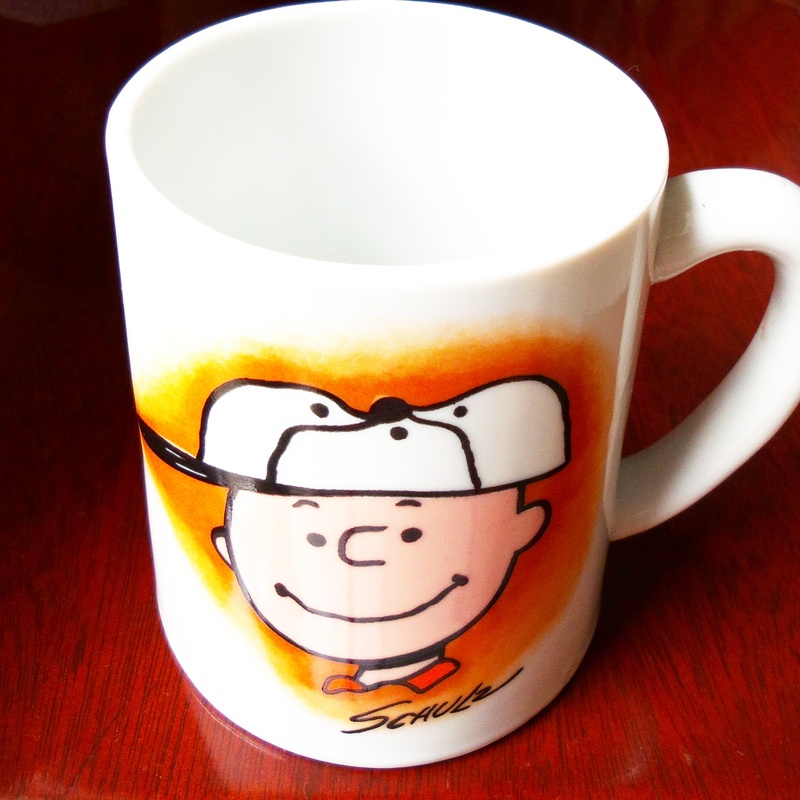 Ah, my dear old Charlie Brown musical mug. I was yanked back to when I was three and bovine lactose-intolerant. Highly-flatulent, itchy, scratchy and irritable as an effect. I was put strictly on goat’s milk. Apparently, more expensive, pasteurized animal secretions are hypoallergenic. Graduating from terrible two’s to temperamental three’s required specialty equipment. From the day I was given that mug I wouldn’t drink from anything else. Until I got my Transformers pop-top water canteen with a built-in drinking straw, of course. But that’s another story. I was just happy to see something special survive the ravages of time and working hands wielding heavy duty Scotch Brite. I wasn’t a big fan of Charlie Brown or any of the Peanuts characters. I loved reading the comics but hated the flatness of the animated series. Disney got us all with the musical and visual spectacles. It was only so much later that I started to understand and appreciate the humor. That Snoopy and Woodstock though. 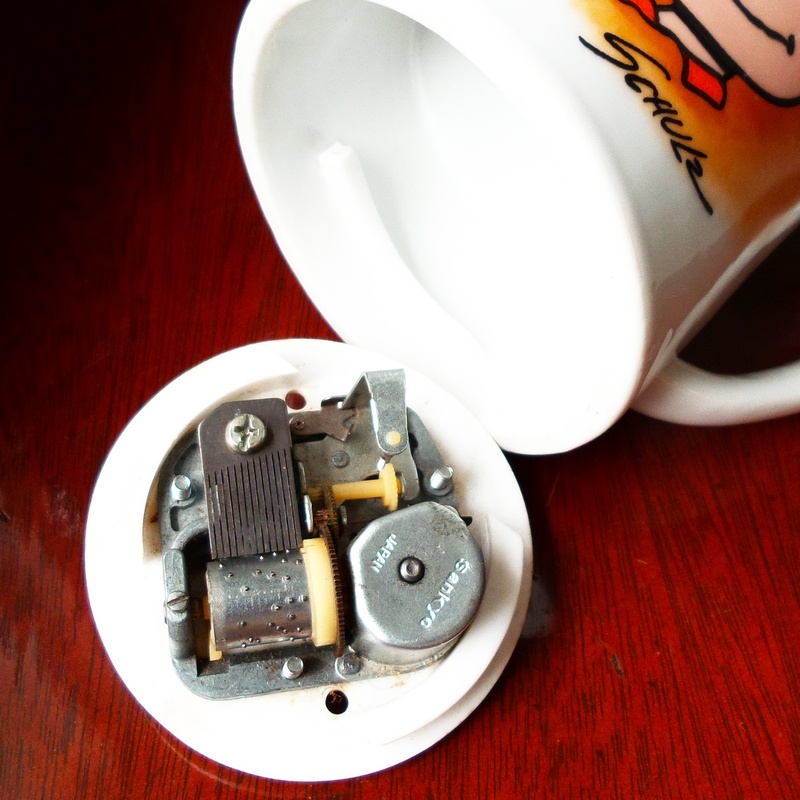 Debussy lived in the screw-on music box in the lower half of the mug. I’ve always attempted to discover what’s behind the magic of most everyday things and my toys. It gives me an equal sense of fear and excitement — the excitement of learning what makes these things tick and the fear of it losing its appeal soon after. Also, the fear I might not be able to put it back together again and the excitement of being able to. The magic was never lost though as the inanimate parts all came together, took on life in movement and, in this case, music. The piece was named after Paul Verlaine’s poem of the same name and, while it was not written necessarily as an interpretation of it or of any story, it is quite evocative of the lines. I could wax poetic here of how (paraphrased from the poem) masqueraders revel on the landscape of my soul singing of love and the opportune life in the minor key, not seeming to believe in their happiness beneath their fanciful disguises. But, no. Standing in front of the cupboard staring through the wall into what used to be a very simple life, the music just brought me back. I put the French press and the Kona back on the shelf, poured some vanilla soy into the mug and sat in the moonlight on our mezzanine clerestory. Moonlight and memories. And soy milk a few days past the printed expiry. This entry was posted in Uncategorized and tagged cebu, charlie brown, Clair De Lune, Debussy, Food, foodporn cebu, hamburgero, milk, musings. Bookmark the permalink.